With approval by the UC Office of the President of a student-initiated recommendation, spring 2016 will be the last regular academic quarter to have exams occurring on a Saturday. Campus leadership worked with ASUCD representatives to formulate the recommendation in response to students’ advocating for an end to Saturday exams and submitted it to UCOP about a year ago. See important dates for fall quarter 2016, and winter and spring quarters 2017. Staff Development and Professional Services is conducting its biannual survey, asking customers for feedback to be used in strategic planning for programs that best meet the university’s training and professional development needs. The father falcon surveys Sacramento. A pair of peregrine falcons nesting on the helipad atop the UC Davis Medical Center recently welcomed an eyass, or baby falcon. The female half of the nesting pair was first spotted around the Sacramento hospital last year, and she was later spotted with a male. In early May, employees reported to Plant Operations and Maintenance that the birds were behaving aggressively. Enter Bill Corbett, a buyer in the Purchasing Department and master falconer, who was asked to help assess the behavior of the falcons. 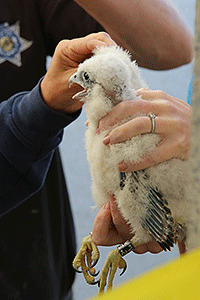 “We are thrilled these falcons chose UC Davis as the place to give birth and raise their youngster,” he said. Banded for tracking by the state Department of Fish and Wildlife. After monitoring the birds’ behavior for a few days, Corbett called the state Department of Fish and Wildlife to assess the risk of harm to people or a helicopter. Based on observed behavior and the nest's location, the department determined there was no threat, and that it was highly unlikely that the falcons would strike anyone. The Department of Fish and Wildlife estimated the eyass hatched on April 27 and projected that the bird would leave the nest at the age of about 6 weeks, or around June 7. Federal law protects peregrine falcons. The nest’s location on the helipad is a safe distance away from where helicopters land. Pilots have been notified of the birds’ presence. The National Cancer Institute has redesignated the UC Davis Comprehensive Cancer Center as “comprehensive,” meaning that the center meets stringent criteria in the areas of laboratory, clinical and population-based research, professional and public education, and in the dissemination of clinical and public advances to the communities it serves. There are only 45 “comprehensive” cancer centers in the United States, out of 69 National Cancer Institute-designated cancer centers. UC Davis received the “cancer center” designation in 2002 and the “comprehensive” designation in 2012. The institute based its redesignation decision on an evaluation a 1,761-page grant proposal that detailed the accomplishments within each of the center’s research programs, and a committee’s daylong visit to the center in March. The 22-member committee comprised institute officials and cancer center researchers from around the country.